There is so much infrastructure damage from Israeli bombing in Gaza & one can only view so many photos of rubble. But a lot of that rubble tells a story so it’s worth going through them because they identify Israeli military targets & document war crimes. This gesturing Palestinian woman lives in Rafah, a town near the Gaza border with Egypt where there are border crossings & also a lot of smuggling tunnels Palestinians use to bring in contraband like foods & medicines from a several page list of vital needs Israel bans. Israel & Egypt have been trying to destroy those tunnels for a few years, including by flooding them with sewage, so that helps explain why there have been several bombing sorties over Rafah. If you look at this photo, it’s clearly a congested residential area indistinguishable from a slum. 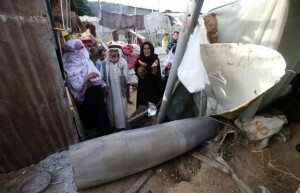 The house with the dud missile is a tin shack belonging to a Bedouin. Can the Israeli military explain how their state-of-the-art aircraft, including drones, mistook a tin shack for a Hamas rocket launcher? Or were they really going for the Bedouin, his family & neighbors? Property damage in Gaza is massive & speaks to several violations of international law governing war. But it’s one thing to show rubble & document infrastructure damage; it’s quite another to show the human carnage of ethnic cleansing. Some political journals have found through experience that little purpose is served showing gruesome photos of dismembered or tortured bodies. More often the barbarities demoralize rather than inspire antiwar opposition. But of course, those being bombed, including small children, witness & are traumatized by what we find unbearable to view. Medical personnel treating the injured have to deal with human beings torn apart, dismembered, charcoaled from burns, & screaming with pain from shrapnel, bombed buildings collapsing on them, & from DIME explosives, the experimental US weapons Israel is developing by use against Gaza. On the one hand, no political purpose or dignity is served by circulating photos of human carnage, but on the the other hand, Israel & other warmakers take advantage of that to conduct the most unspeakable human rights & war crimes in secret. The way to get around the apparent dilemma is to describe the kinds of weapons Israel is using & what damage they inflict on human bodies. Many writers have done this over the course of many wars, describing the effects of Agent Orange & other biological weapons in Vietnam, depleted uranium in the Gulf War, white phosphorus & DIME explosives in Gaza. In an interview on Democracy Now, Dr. Mads Gilbert, a Norwegian doctor who has treated in Gaza through the past 17 years, described the bombing injuries & mutilations from DIME. He said more important than medical teams, “The most important medical thing you can do now is to force Israel to stop the bombing, & to lift the siege of Gaza. Then the Palestinians will manage well themselves.” For those of us overwhelmed with grief & feeling helpless before Israeli genocide, Gilbert just laid out our mission: building massive, consistent, persistent, committed public opposition to the massacre in Gaza & building broad participation in the boycott campaign.